Rachel has leukaemia, and Greg’s mom gets the genius idea that Greg should befriend her. Against his better judgment and despite his extreme awkwardness, he does. When Rachel decides to stop treatment, Greg and Earl must abandon invisibility and make a stand. 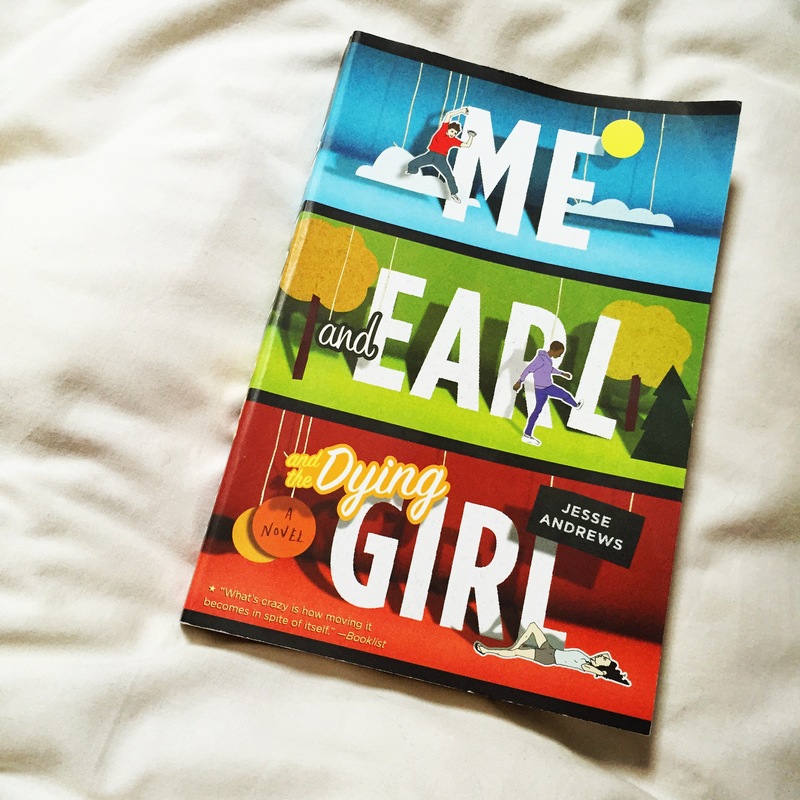 It’s a hilarious, outrageous, and truthful look at death and high school by a prodigiously talented debut author. The cover and premise had me so excited for this book, I mean, LOOK AT THE COLOURS (Yes, I’ve used the picture I posted on Instagram because I loved how it turned out). How many books are this colourful? I don’t think there’s a colour that isn’t used (unless you’re really picky and start naming shades… Don’t be that person…). I also love books that have a similar premise (i.e. kid with cancer / illness) not in a morbid way, they’re normally profound and brilliant. For example, I loved The Fault in our Stars and I also loved Zac and Mia (review here). Unfortunately I did not love this one. It was okay. I liked parts. I particularly liked the structure of it – the use of scripts and the aesthetic both on the inside and outside of this book. I did also, however, find the character of Greg irritating, and Earl just rude. Rachel seemed nice enough, there just wasn’t enough of her in the book, it was very much Greg talking about himself. I didn’t like the narrative voice. As I’ve said, I don’t like Greg. Okay, I completely understand that some of the things he says are probably true (in other words they’re the things that everybody thinks and nobody wants to say) but I just found his lack of empathy for Rachel irritating. At points it was like he wasn’t even trying. Like I get him not treating her like she’s about to break etc but instead of complaining about having to see her he could at least have been a bit more cheerful for her. Even Earl was nicer than Greg at points and I found Earl to be quite rude most of the time, as he showed pretty much everyone no respect. Also, I didn’t find this book funny. I can probably count on one hand the amount of jokes that I laughed at. Reading the reviews on goodreads I do realise that a lot of people did find it hilarious, I just really didn’t. I think that may have been because Greg was grating on my nerves so anything he said just annoyed me though! I was expecting it to be humorous because of what people had been saying about it and I was disappointed when I found a lot of the jokes to just be silly comments. If that makes sense. I felt that the plot lacked something as well. It wasn’t that it was a terrible plot at all (Jesse Andrews’ writing I found to be very good and the plot was interesting), I just felt that it was missing something. Like there could have been more and it wouldn’t have been too much – it would have made it more interesting. A lot of it was almost the same thing repeated (a lot of the repetition was regarding his film making). I also found it to be quite slow paced, which, because very little (I felt) happened, bored me in places. Jesse Andrews, however is clearly a very talented writer. I liked the way that his writing was so realistic – it sounded very much like a teenage boy (one I don’t particularly like) would speak. It was quite brutal, but not aggressive – just honest. I do quite like that in writing. I’m not one to sugar coat things myself (after all, you are reading this not quite complimentary review) but I’m not for rudeness either. Just brutal honesty. I do believe that the reason I didn’t enjoy this book as much was because I had such high expectations, and when I found it didn’t meet those expectations, I was disappointed and didn’t enjoy the rest. Maybe one day I’ll reread it and enjoy it much more because I know what to expect! I think I would still recommend this book to some people, despite the fact that I didn’t particularly enjoy it. This is because my sense of humour differs greatly from my friends’ (for example I do not find sitcoms funny in the slightest, I just feel awkward watching them as the actors just seem to be making fools out of themselves – but that’s just me, most of my friends find sitcoms hilarious). Back to the point. What I’m saying is that my sense of humour differs from the majority and therefore the majority would probably find this novel humorous and really enjoy it, which is why I’d recommend it. It’s also a super-quick read for a day where you’re doing nothing! And who doesn’t want that gorgeous, vibrant cover on their shelf? :O I said the same thing. I loved the cover (because let’s face it, those colours are just gorgeous!) and then I unfortunately didn’t love the book. It wasn’t bad but definitely not among my favourites. Haha! I’m glad somebody agrees with me because everyone seems to love it so much! I am kind of interested in the movie though. I didn’t have a chance to watch it yet. I haven’t seen or read any of those! Haha!